Could franchising be the key to your expansion? 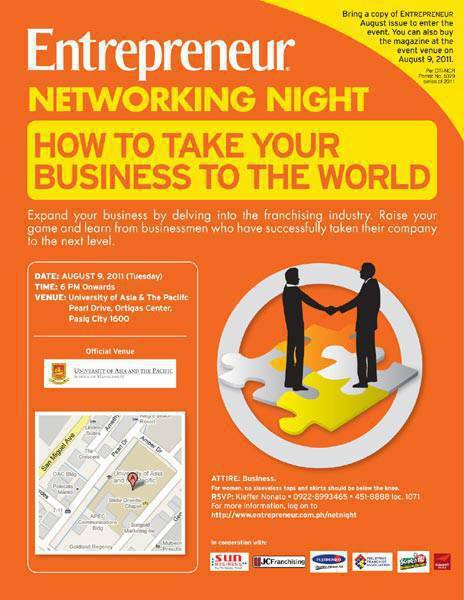 To give you a better understanding of franchising, Entrepreneur Philippines is coming up with its third Networking Night this year with the topic "How to take your business to the world." The topic will revolve on how franchising can help expand your business – whether locally or on an international platform. Being the leading franchising country in Asia, it comes as no surprise that most aspiring entrepreneurs in the country are looking at getting a franchise as their ticket to entrepreneurship, while a number of local companies have drawn up franchising as their primary strategy for expansion. A study released by the World Franchise Council showed that the Philippines has the second most number of franchisees in the world, next to the United States. The country has more than 124,000 franchisees while the United States has 765,723 franchisees. Despite all the success stories that have been told and retold about franchising, it still needs just as much work and attention as any other business model. Franchise brands need the hands-on attention and the continued support of the franchisors. To attend the event, just bring a copy of the August 2011 issue of Entrepreneur Philippines at the University of Asia and the Pacific on August 9, Tuesday. The event will start at 6:00 p.m.